Arsenal teenager Benik Afobe has revealed he turned down the advances of Barcelona to stay with the north London club. 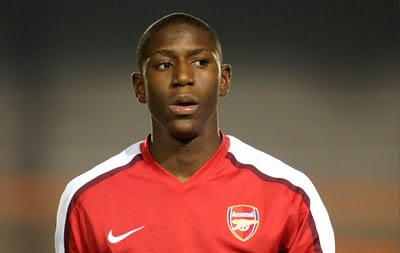 Afobe, 17, a highly rated England under 17 international, is one of Arsenal academy's most promising young players. Arsene Wenger is a big fan of the striker, who is currently on loan at League one side Huddlesfield Town. Speaking with The Football League Paper, Afobe revealed his dream of representing the Arsenal first team and the interested from Catalonia. "I'm delighted when I hear Arsenal fan say good things about me and being part of the England kit launch was a really good experience. "But I don't let it get to my head I come from very level-headed family and my mum and dad have raised me not to think I'm better than I am. As a youngster you never know what could happen in the future. "Barcelona did come into me. They watch a play to the England under 17 is and I did well in the game - I scored two and set up to that day. "One of their representatives spoke to my dad after the game. I was flattered but there is only one team I want to be out and that is Arsenal, to progress and play to the first team one day. "Barcelona and one of the best teams in the world, but I did not think it was the right move for me or my family."